Uncertainty and a risk-averse mentality are holding councils back from adopting new technologies and solutions that could revolutionise the way we manage our trash. So, will big data help pinpoint exact savings and operational efficiencies? Patricia Moore reports. With an estimated three million tonnes of waste ending up in New Zealand’s municipal landfills every year, Kiwis are not exactly shining stars when it comes to managing trash. We’re not alone. Regardless of the worldwide necessity to ‘reduce, reuse, recycle’, we’re living in a throw-away society, constantly exhorted to buy something bigger, brighter and shinier. Consumerism rules and the cracks are starting to show. Wellington’s southern landfill, for example, has just eight years’ capacity remaining. Ratepayers could have to stump up $12 million to extend the facility or come up with smarter, more innovative solutions. On a global scale countless technologies and solutions exist within the solid waste sector, explains Paul Evans, WasteMINZ chief executive. “However, it’s fair to say that in New Zealand we have shied away from many, often due to the associated uncertainty and risk. Tri-Combi low entry vehicle (LEV) which separates glass and compacts waste. Paul believes the future of innovation in the solid waste sector will be less about new ways to treat or recycle waste, and more about data – timely, accurate and complex data, driven by networks of interconnected technology with embedded sensors. Technology is allowing the sector to evolve in ways barely considered a decade ago, says Ben Calvert, product manager at Manco Environmental. Last year BigBelly bins around the world captured more than 424 million litres of waste and recycling, he says. Anthony Kirk, principal hydrogeologist with GHD, says traditional methods have long been associated with adverse environmental effects and nuisance to the public. It’s happening across the board. Ben Calvert cites developments from hybrid low entry vehicles (LEVs), designed for collecting rubbish in urban areas, which meet the highest ergonomic standards and provide an economic, one person operation, to innovations minimising the amount of waste going to landfills. The ubiquitous drone is also hovering. Ben Hutchinson, senior environmental scientist at GHD, says when it comes to using drones as a tool for assessment, the technology is improving at such a rate that it’s becoming more economically feasible to use customised drones for specific monitoring and assessment tasks. One current use is detecting and monitoring methane gas leaks in closed landfills. Innovation isn’t all focused on technology. Alice Grace, senior consultant with Morrison Low, notes increased collaboration between the community and medium-to-large waste companies. She envisages more local bodies seeking such partnerships, “particularly as they look to identify options to address district-specific waste issues for their new waste management and minimisation plans”. Anthony says local authorities carrying out waste management activities can expect to undertake a higher level of monitoring and demonstration of appropriate management. “Collection and interpretation of compliance information will require greater understanding of both waste management and environmental processes,” he says. And, as the scope of data gathering widens and the amount of data gathered increases there will be challenges in interpreting it in both a quantitative and qualitative sense, says Paul. 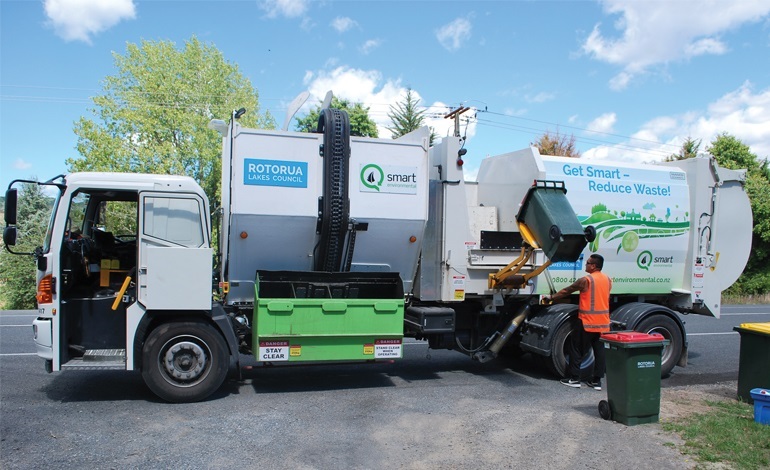 Some councils are already using this technology on a small scale, says Paul, but innovations, such as remote sensors that indicate when a bin is full, thereby optimising collection routes and frequencies, have been relatively expensive. “The payback, in the short term, has been a challenge. However, costs are rapidly decreasing while quality and reliability is increasing so we are close to a tipping point where it makes absolute sense for councils to embrace digitisation of waste. And it’s sustainability as a whole that’s driving innovation in the industry, says Ben Calvert. This article was first published in the April 2017 issue of NZ Local Government Magazine.